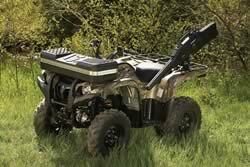 Yamaha Motor Corp., U.S.A., built the toughest, most off-road capable and versatile ATV in the Grizzly 700 FI with Electric Power Steering (EPS), and consumers have responded making it the best selling big bore utility ATV today. "The Grizzly 700 FI with power steering set many standards in quality and innovation," said Yamaha ATV/SxS Marketing Manager Steve Nessl. "Teamed with the all-new Grizzly 550 FI with power steering in 2009, the Yamaha Grizzly line of utility ATVs is stronger than ever." In addition to new colors, the latest version of the Grizzly 700 FI gets a new and improved gate style gear shifter on the left side of the vehicle that makes it easier for riders to switch between High, Low, Park, Neutral and Reverse. The Yamaha EPS system is unparalleled in the industry and has received numerous awards and countless customer praise. As the rider turns the handlebars and the torque- and speed-sensing EPS system senses the twisting force put on the handlebars and wheels, the electric motor assists in the turn. The harder you turn, the more the EPS assists allowing the rider to tackle the toughest terrain with the least amount of effort. The Grizzly 700 FI without EPS starts at approximately $800 less (MSRP) and comes with all of the benefits and features as the EPS version — plus steel wheels. Included in the list of highlights for both models are a forged piston for reduced weight and added durability, while an aluminum cylinder body with composite coating offers reduced weight, increased cooling ability and additional wear resistance. The roller rocker arms reduce friction in the valve train, which allows the engine to rev more freely leading to better overall performance and improved throttle response. Of course, the ultra-convenient electric start feature continues to make firing the liquid-cooled, four-valve SOHC powerplant to life a snap. Delivering all that power is the industry-exclusive Ultramatic automatic transmission system. The transmission’s gearing makes full use of the powerband under a variety of riding situations, and the automatic centrifugal clutch maintains constant belt tension for reduced belt wear and industry-exclusive all-wheel downhill engine braking. The new gate shifter allows the rider to easily see what gear he or she has selected. This is also easy to see on the redesigned LED display, which offers dual trip meter, speedometer and odometer in addition gear selection, fuel level indicator, On-Command indicator and EPS and fuel injection indicator lights. The EPS and fuel injection indicator lights let the rider know when the systems need to be serviced according to the self diagnostic system. The Yamaha Fuel Injection system (YFI) improves throttle response throughout the powerband, helping the rider take advantage of the Grizzly’s low- to mid-range power. YFI offers unmatched performance at high elevation as the system is able to detect and compensate for changes in altitude. The more precise fuel delivery offered by the YFI means clean power delivery, better throttle response and improved fuel economy under a multitude of riding situations. In addition, YFI means no choke and easier cold starting. The three-way On-Command system, featuring push-button 2WD/4WD and 4WD with differential lock, is the perfect compliment to the Grizzly 700 FI powerhouse. Located on the right handlebar, the push-button is at the rider’s fingertips to command all four wheels as the terrain dictates. When it comes to the features under the surface, the Grizzly has you covered. The air box is located on the top of the engine providing easier access and service for the rider, and the fuel tank is placed under the seat for maximum centralization of mass. Moving on down the body of this beast we find a fully independent wishbone front and independent rear suspension (IRS). The adjustable suspension in both front and rear offers the rider the versatility to set-up the ATV for all riding conditions. Featuring 7.1 inches of travel up front and a class-leading 9.5 inches in the rear, the Grizzly 700 FI is ready to tackle just about any terrain. What’s more, 11.8 inches of ground clearance makes it an unrivaled trail performer. As if one industry first with EPS wasn’t enough, Yamaha continues to pile extras onto this class leading model in the form of four-wheel hydraulic disc brakes. Most full-featured models see three discs, two up front and one on the rear axle, which controls braking for both rear wheels. In the case of the Grizzly 700 FI, brake calipers are coupled to each wheel individually for unmatched braking feel and power. The Grizzly 700 FI also features ground-grabbing tires mounted to aluminum wheels to get you moving. The Dunlops feature a Yamaha-exclusive tread pattern for excellent traction and rider comfort. The Grizzly also has a thick, plush seat and full floorboards for comfort and protection from the elements. The design of the floorboards also allows for better drainage of mud and water. Two storage boxes — one under the seat and another in the right front fender — offer plenty of storage in a sealed, waterproof and water resistant space. This is in addition to the 99 pounds and 187 pounds of carrying capacity on the front and rear racks, respectively, and the 1,322 pounds of towing. And, the SecureMount rack system offers superior fit and finish with Genuine Yamaha Accessories, which are designed in tandem with the rack system. Both 2009 Grizzly 700 FI models (with and without EPS) are available in Hunter Green, Steel Blue, Black Metallic (MSRP $8,599 with EPS and $7,799 without) and Realtree AP HD Camouflage (MSRP $8,999 with EPS and $8,199 without).